Add some colour to your life. 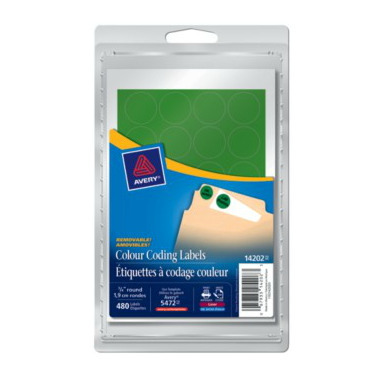 These Removable Print or Write Colour Coding Labels aid in organizing your home or workplace. These 3/4" round labels stick firmly to documents, inventory, sale items and more to draw the eye and help keep your important objects well sorted. Mark notes on the labels by hand or print them with either your laser or inkjet printer. Removable labels let you peel them away when you no longer need them. Be bold and colour your world a little brighter!